In 19th century England cows were milked in the fields or, in winter, in cowsheds. Milkmaids would carry their buckets and milking stools and go to the cows. 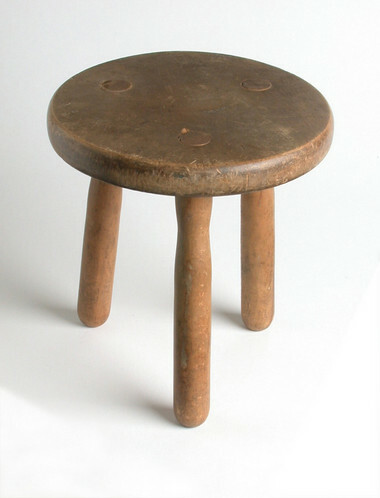 Milking stools were normally carved from elm wood with legs of ash wood. Most were three legged so that the milkmaid could lean forward into the cow without toppling over. On uneven ground, three legs are more stable than four. The milkmaid would sit with her face resting against the side of the cow and would stroke the cow's udders with her hands using a gentle pulsing action that mimics the sucking of a calf. All four teats or quarts would be stroked until the bucket was full, or until the cow had yielded her morning supply. Milk yields varied but on average a cow would produce 10 -15 litres per day. Cows were milked by hand twice a day, early in the morning and again at lunchtime. The milk would then be carried back to the farm dairy to be made into butter and cheese, or cooled before being sold as milk to drink. The dairy cow gives birth to one calf a year and, like all mammals, makes milk to feed her baby. She will produce milk for up to ten months after the birth if she is milked at least twice a day. The amount of milk a cow produces varies according to the breed, health, age of the cow and how well she is cared for and fed. Generally cows produce more milk in the summer when fresh food is plentiful. The average yield is 10 to 15 litres a day. Aberdeenshire dairy cows, a popular breed in the 19th century, could produce as much as 31 litres a day in the months following the birth of a calf. The breed of cow kept in most London dairies in the 19th century was the Short Horn. This breed produced a good yield of milk, though not as much as Highland cattle. The advantage was that once the calfing period was over, cows were suitable for fattening up for the butcher. They would then be sold to Smithfield, the large London meat market. Today, the most popular breed in Britain is the black and white Friesian cow. All milking was done by hand in Britain until the 1850s when mechanical devices were invented. Many of these were not only expensive but actually injured the cows and tainted the milk with blood. The transition to mechanised milking in the dairy industry was not complete in Britain until the 1970s.